The 2011 Geneva Motor Show will see the world premier of the BMW ActiveE. Based on the current BMW 1 Series Coupé, the BMW ActiveE is the second electric test vehicle to be created by the BMW Group. With four seats and a luggage compartment of 200 litres, the BMW ActiveE is the first electric vehicle from the BMW Group to combine the space and comfort of a traditionally powered BMW with a fully electric drivetrain. Intelligent packaging ensures that the driver and all three passengers have the same head, leg and shoulder room as they would in a standard BMW 1 Series Coupé. At the heart of the BMW ActiveE is a powerful electric synchronous motor which propels the car from zero to 60mph in just nine seconds, delivering 168hp and maximum torque of 250Nm, from a standing start. While its top speed is electronically limited to 90mph. The BMW ActiveE maintains the dynamic driving style that is typical of a BMW, with a low centre of gravity and 50:50 weight distribution to enhance traction and power transfer of the high torque. Replacing the engine block, transmission and fuel tank are three large energy storage units containing lithium-ion cells, developed in conjunction with SB LiMotive. These modules are protected by a steel-plate battery housing with integrated liquid cooling system, to keep the batteries at optimum operating temperature helping to increase the range. These housings also help to ensure that the BMW ActiveE meets the same stringent safety standards as the BMW 1 Series Coupé, meeting and exceeding the levels legislated. The BMW ActiveE is engineered so that when the driver takes his foot off the accelerator pedal the motor becomes a generator and feeds the electricity created from kinetic energy back into the vehicle battery, while at the same time braking torque is created, slowing the vehicle down. This recuperation of energy can increase the range by up to 20 per cent. For the first time in a BMW Group electric vehicle the BMW ActiveE features an ‘intermediate position’ for the accelerator pedal that results in the car’s own kinetic energy being used to move forward, without consuming energy from the batteries. In essence it is a ‘gliding’ mode. With previous electric vehicles when the accelerator lifts the car automatically starts to brake. To further increase the range of the BMW ActiveE ECO PRO Mode can be selected whereby the drive configuration and comfort functions are modified to use less energy and facilitate a more efficient driving style. In ECO PRO mode the heating and air conditioning system are programmed to use less energy and the accelerator demands less power with the same travel. The BMW ActiveE retains the dynamic looks of the traditionally powered BMW 1 Series Coupé but with circuit inspired graphics, a scoop in the bonnet and a closed rear apron, with no exhaust pipes, to distinguish it. Inside Pearl Grey Dakota leather seats with Blue contrasting seams, along with a revised instrument cluster are the main indicators of the electric drivetrain. Instead of the traditional fuel gauge and rev counters the dials show the level of charge left in the battery and the amount of energy being used and recuperated. The BMW ActiveE is not dependent on a specific energy source and so can be charged using 32-ampere wallbox in five hours, or overnight from a conventional domestic socket. This allows greater flexibility allowing the car to be charged wherever there is an electricity supply. Starting in 2011, a test fleet of over 1,000 BMW ActiveE vehicles will be trialed in the USA, Europe and China and will provide valuable insights into the everyday use of the electric vehicle. 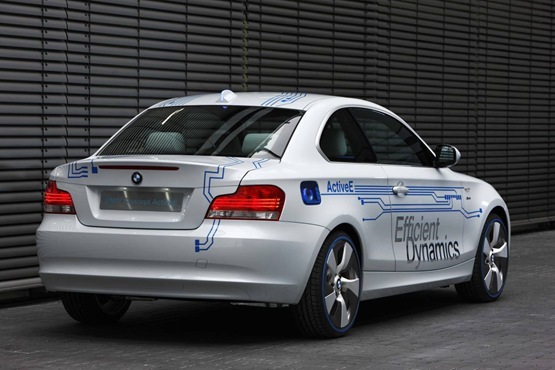 The knowledge and insights gained from the field trials of the BMW ActiveE will be fed back for the future development of the Megacity Vehicle, due to go into production in 2013. BMW UK will be leasing BMW ActiveEs to select customers. Further details will be announced in due course.